So, my son is obsessed with food trucks. I don’t know why–maybe from TV or something, but he keeps asking if we can stop and have a taco or a burrito from one. He doesn’t get it that the fancy food trucks they have in the big cities are NOT the ones that we see at the construction sites in our small town. Heh. 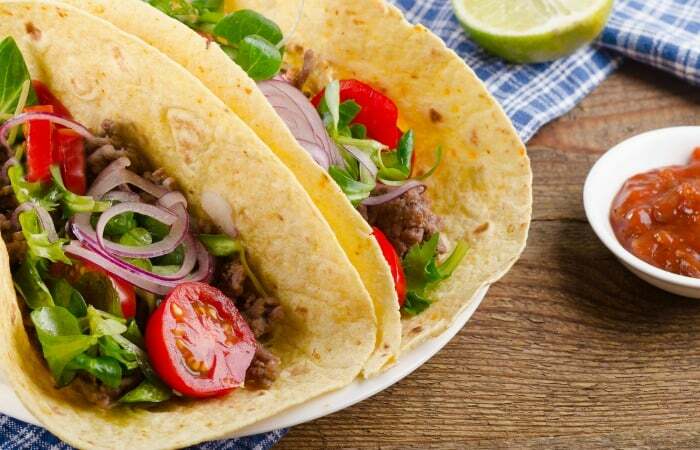 So, I, having sampled some actual awesome street food, whipped-up these Easy Mexican Street Tacos for my boy and he was absolutely impressed. He still asked if we could stop at the next food truck he saw the next day…but what more can I do? Heh. Seriously, he’s 13 (soon to be 14). I think he must have seen the food truck thing on YouTube or something. I don’t know. He’s so easily influenced and has no idea that he can make at home the things he sees on the screen. Heh. 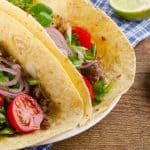 I, having sampled some actual awesome street food, whipped-up these Easy Mexican Street Tacos for my boy and my son was absolutely impressed. He still asked if we could stop at the next food truck. Fail? Rub the steak with a tablespoon of the olive oil. Place steak in a pan over high heat. Sear on both sides, then turn down the heat and allow to cook all the way through to your preferred cooked-ness. Slice onion and chop cilantro. Chop steak into tiny bits. I find it best to use a large butcher knife and make noises like the Muppet's Sweedish Chef. Put steak, garlic, cilantro and juice from the 1/2 lime into the pan and stir it around while the pan is still warm. Not to cook it as much to just stir it together. So, you can immediately remove it from heat. 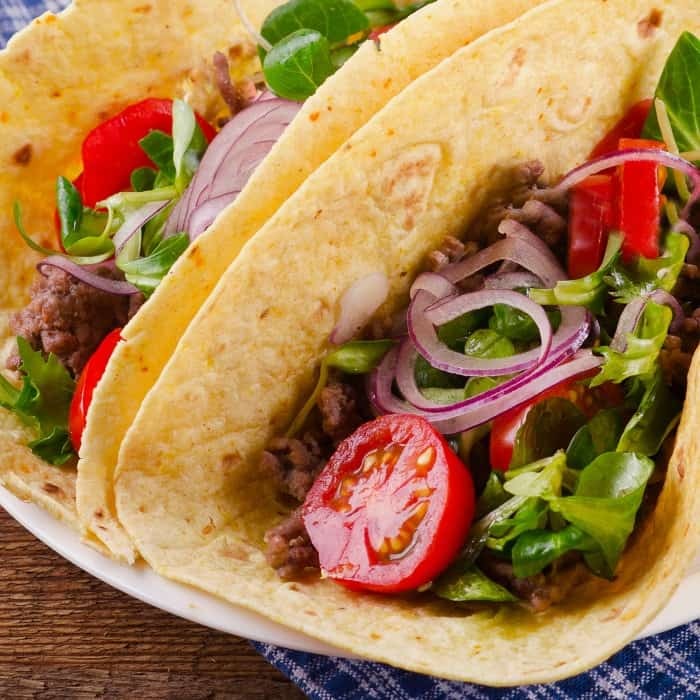 Throw the tortillas into the pan and get a little of the meat-veggie flavoring on them. Serve with sliced tomatoes and lettuce--and even some sour cream, if that's your bent. Heh. Ok, so, after you make these, I totally want to hear how they turned-out. 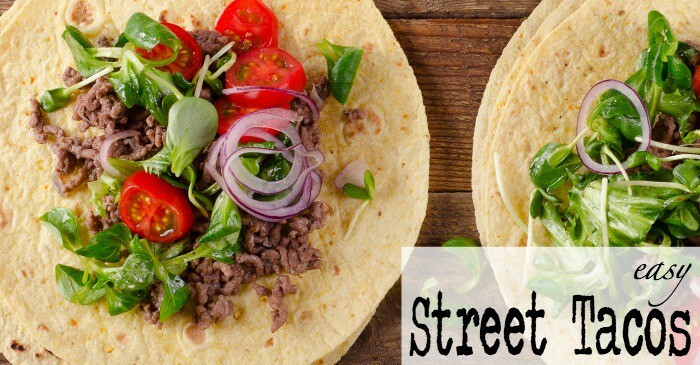 Just drop me a comment below or shoot me a pic of your Easy Mexican Street Tacos on Facebook. I’d love to hear if you liked them as much as we did.